And I don't know why, but until now I thought you used Allman indentation style. Lacking anything constructive to say, I'll just say this: "One can not simply getroottable()." Or possibly this: "Man, I can't wait to get me some inventory." While not required, I find putting else statements in places like that makes the intent of the code more understandable, and if the return is replaced, the logic is still intact. No warning message if a null is passed as the argument? Must be a standard case you need to support for some reason. So many other specific warning messages, you must be in serious debug mode. When you don't camel case your getroottable it means something very different in Australia! Totally unrelated to the code itself; you should take a look at polacode or carbon for sharing code as images. Now, with regards to the code, what's this for? I'll admit excitement at prospect of you working on a game with a prominent inventory. Do you do all your games in python? Do you have anything written on subject? What's your experience in terms of performance etc? You should try TypeScript. It provides gradual static typing to JS and really helps when the project gets large. 1. I use python for tools, never for run-time game code. Too many performance issues. 2. This isn't Java, it's Squirrel (what I used for TWP). Get null passed in is not an error, so it just flows null back up and it's checked/ignored higher up. you should take a look at polacode or carbon for sharing code as images. I don't use VS Code and for Carbon, I'd lose all my custom syntax coloring. 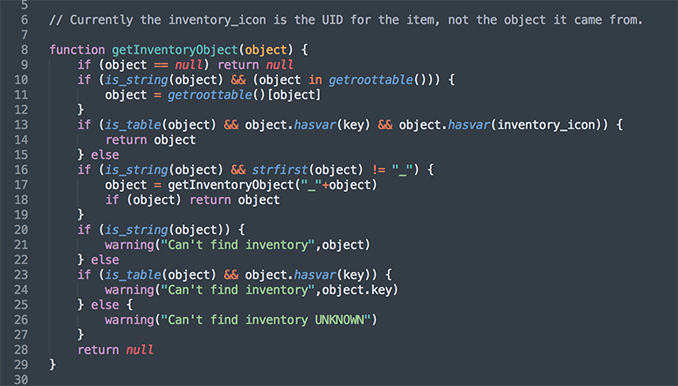 I don't plan on sharing very much code (this was just a lark), so just taking a screenshot is fine. I love how every time you share code, there are so many comments on how it could be better, or disbelief over which editor configuration you have. That's programmers, I guess. Well done, sir! That is undoubtedly evidence of great progress! Changing subject, Ron, have you seen my dime? I come here every week. Since like forever. Wanted to let you know that. Thanks for everything. What was your favorite 6502 assembler? That's a lot of validation for just one character. Is this from a new game ? :) interesting language btw.